This was a fun, collaborative project! 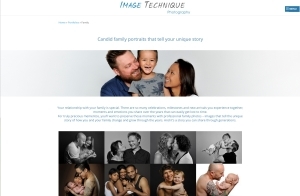 Inner west Sydney family and newborn photographer, Image Technique engaged me to rewrite the Family, Baby, Maternity and Corporate pages of his website to add impact and create an emotional connection. The client also wanted to improve his Google ranking and this project involved basic keyword research, and the SEO copywriting of each page.